Posted on October 18, 2018 by thelostlighthouse	in Comics, Literature and tagged art, Black Panther, comic book review, comic books, Joe Sabino, Jordie Bellaire, Leonardo Romero, Literature, Marvel, Marvel comics, Nnedi Okorafor, Sam Spratt, Shuri, superhero comics, superheroes, TLL, VC's Joe Sabino, Wakanda. Our pal Kit reviews comics for us! This is one of those reviews. While I was at a friend’s over the weekend we re-watched Black Panther, because it’s fantastic of course. There’s a pretty strong consensus between us that Shuri is one of the best characters in the film as well. 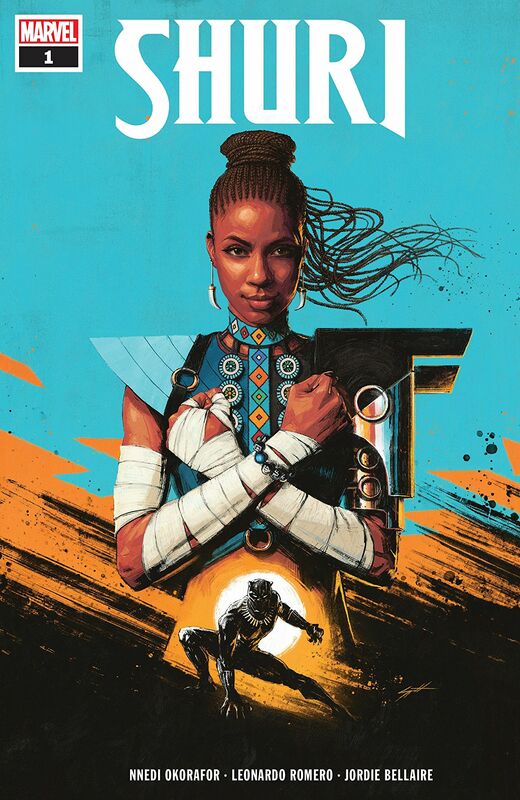 This meant that when I saw Marvel were releasing a Shuri comic series this week I had to check it out, especially with the wonderfully realistic front cover drawn by Sam Spratt which caught both my attention and a likeness to Shuri in the movies that makes the comic very recognisable for new readers who will know her from the movie. I’ve really enjoyed Marvel’s Black Panther runs previously, so looked forward to seeing Wakanda and the stories it holds from somebody else’s perspective. The story begins with a brief overview of Shuri’s history in the Marvel Universe. Explaining some of her previous adventures and the powers she’s obtained. With T’Challa currently busy elsewhere in the Marvel Universe, Shuri has time on her hands to focus on her inventions and some of the significant issues in Wakanda. We get to see her relationship with her ancestor’s and the dichotomy between her modern attitude towards those issues and those of her family and ancestors. We’re also treated to a flashback which defines her relationship with her brother and how the movers and shakers within Wakanda view her. To avoid any particular spoilers, the set up presented at the end of this issue could easily have been shunted in right at the beginning, which would have been a shame as we’d have been deprived of the chance to get to know this incarnation of Shuri that Okorafor is able to bring out. Bellaire’s light pallet provides a sense of reality to the issue. The less bold tones providing some gravity as opposed to intense wackiness seen in some comic books. The flash back is presented in very contrasting red and white giving an other worldly sense to the spectacle. Finally, the shift to warmer tones in the setting sun during the final scene gives the sense of change that the issue delivers to the state of affairs in Wakanda as well as Shuri and her story. Romero’s art compliments Spratt’s eye-catching cover art well, keeping the characters recognisable to those who only know the films to date. I’m very familiar with Sabino’s work now which as usual is well worked into the issue in both spoken and online chat format. My only issue with the set off for the series is I’m worried Shuri will simply fill in shoes that are not her own as opposed to really fitting into hers. We’ll see however. 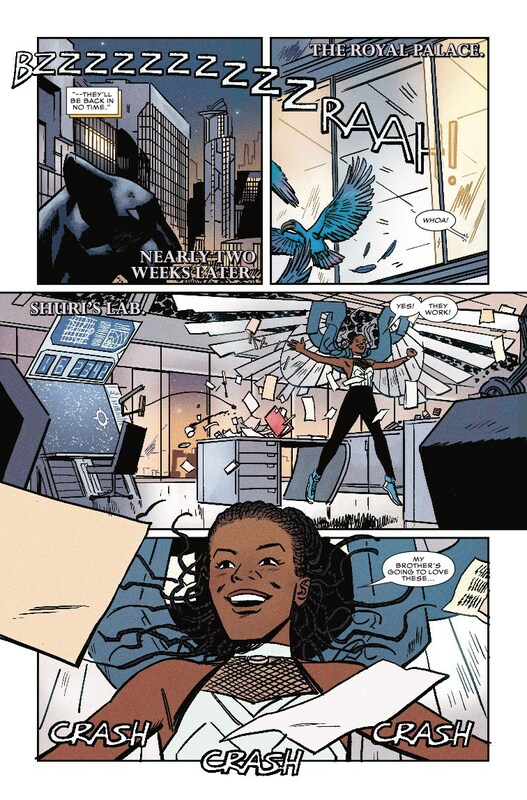 Okorafor clearly has a talent for Shuri, who is definitely in a safe pair of hands.